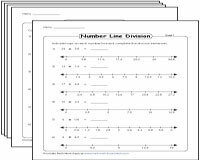 This compilation of number line worksheets is exclusively drafted to aid students of Grade 4 to understand the place value of decimals. 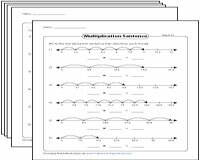 The worksheets are split into different levels to enable convenient downloads. A number of free worksheets are also up for grabs! 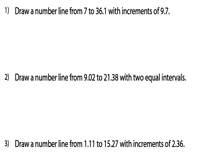 Observe the units of intervals on the number line and identify the correct decimal number. 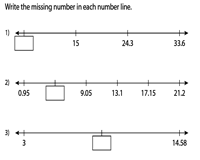 Number lines are split into decimal place values in tenths, hundredths and thousandths respectively. 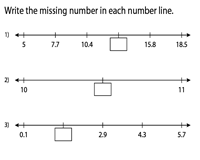 In this series of number line worksheets, students should find 2 or more decimals missing from the number line. Get ample practice on a mixed combination of place values. Level 1 worksheets contains place values in tenths and hundredths. Level 2 comprise decimal values in hundredths and thousandths. 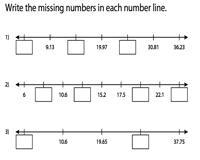 In this set of mixed review worksheets, fill in the missing decimals on the number line. Two or more decimals are missing in each problem. 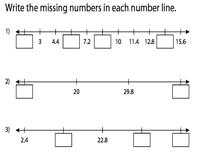 Represent the letters on the number line with the decimals based on the intervals observed. 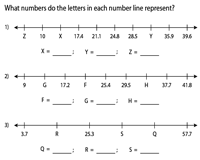 Substitute the letters on the number lines with decimals in either tenths or hundredths in the Level 1 worksheets; and in hundredths or thousandths in the Level 2 worksheets. 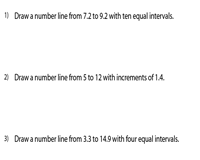 Draw number lines based on the intervals or increments provided in the worksheets. This set of mixed review worksheets contains decimals up to thousandths. 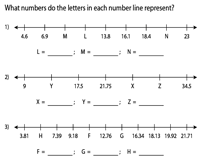 Access this assortment of worksheets to learn how to add decimals using number lines. 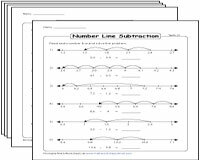 Get an access to 100+ number line worksheets based on decimal subtraction. 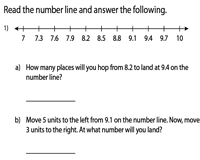 Read each number line and answer the word problems that follow. 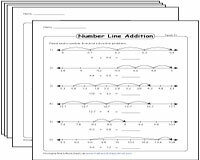 Employ this set of worksheets to master decimal multiplication using number lines. These print-ready worksheets feature an engrossing number of concepts like finding the missing decimal, framing sentence using rulers and more. 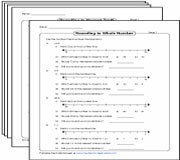 Practice this assemblage of rounding decimals using number line worksheets to master the concept of rounding to the nearest whole numbers, tenths, hundredths and thousandths.